My schedule for the upcoming period is very active! I will be participating at international design conferences and events all around the world, where I will be giving lectures and workshops focused on Arabic Design and Typography. This is a chance to advocate and share my research and design work at Tarek Atrissi Design, but an opportunity as well to interact with the local design scene in different countries and cultures. 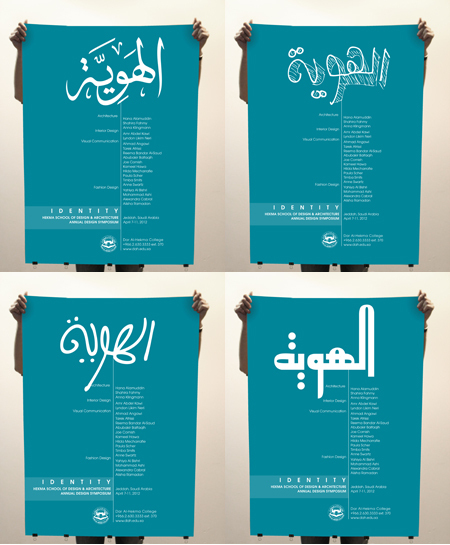 I will be giving a talk at the Type Directors Club in New York on March 15 2012, entitled “Arabic Typography and Cultural Identity”. The lecture will cover the cultural challenges in defining and visualizing an “Arab Identity”, particularly in a graphic and typographic context. Recent projects in Arabic lettering, calligraphy and type design will be showcased through an analysis of the current design trends and inspirations in the socio-cultural climate of the Arab world today. The lecture will be broadcasted online live at the following link. It will be accompanied by another talk by my friend and colleague Nadine Chahine and together we will be making a very special “typographic” announcement. I will be present next for the Nuqat conference in Dubai, an event taking place during Dubai Design Days, where I will be giving a Lecture under the theme “Arabesque, Identity, and Arabic Typography.” In addition, Nadine and I will be conducting a 3-day workshop on Arabic lettering and Type Design. This will be my third consecutive participation at the event since it began in 2010. After that, I will be heading back home to Holland for my next lecture and workshop on April 3rd 2012 at the “Academie Beeldende Kunsten” in Maastricht (ABKM). My lecture will be open to the public, themed “Cross Cultural Design,” and will be followed by a workshop that I will conduct with the third year students of the visual communication department at ABKM. The next event will be in Jeddah, Saudi Arabia, where I will be returning to the HSDA Annual Design Symposium at Dar Al-Hekma College to give a workshop open for professionals and to the school’s Alumni. This year’s event, under the theme “identity”, will include an impressive list of participants, including Paula Scher from Pentagram, probably the most successful women in the graphic design scene today. In addition to participating in the event, I was chosen to design its identity, look and feel. 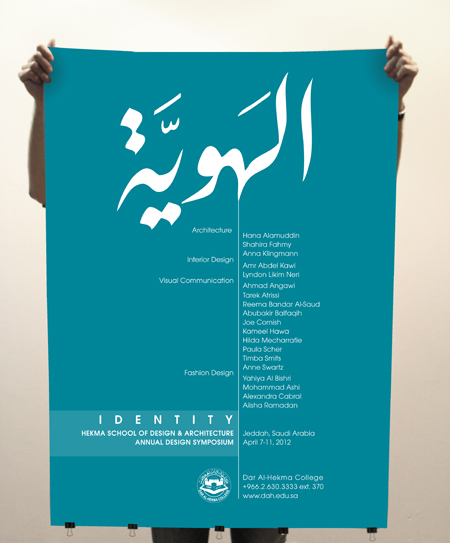 This was a challenging task: how do we design an identity for a conference with the theme “identity?” A typographic solution was adopted, where the Arabic word Al-Hawiya (Identity), keeps changing in style and character to reflect different personalities (through various calligraphic, typographic, or lettering solutions). This was a fun typographic exercise that constantly changes with the expansion of the identity. We are currently working on applying this concept onto all the names of the speakers participating at the event. A sneak preview of the adopted design solution is shown in the poster below. My next stop will be Kuwait where I will participate in REUSE, an annual exposition promoting eco-friendly living, between 19 and 22 April 2012, for the first time. My lecture title will be “Design for a better Arab World”; and the workshop will be entitled: “The Designer as an eco-Friendly Activist”. The following month, I will be in Portugal on May 13 at the “Next Future Observatory” upon invitation from The Calouste Gulbenkian Foundation, to present the exciting research work and new design foundation I have been working on with Hala Abdelmalak, but more details on that will follow soon! Finally, i will be a speaker at the branding session of BIFEX (Beirut International Franchising Forum and Exhibition) in Lebanon on 23 and 24 May 2011.